I was a big royal watcher back in the 80s. Lady Di was only a little bit older than me, and there she was, marrying into royalty and becoming a real princess. I got up early to watch her wedding live, tearing myself away from the tv a few hours into the coverage only because I had to go to work at the temp job I was doing that summer between my first and second year of college. Later that morning, I left my desk to watch on the break room television as the couple left for their honeymoon. In the early years of her marriage, I collected books and clipped magazine articles about Diana, bought Royalty and Majesty magazines, studied her fashion choices, and for a time even subscribed to a club that sent out doll-sized copies of her outfits every other month. In the late 80s, after I'd gotten married myself, I was fortunate to be able to accompany Mr. Karen on a business trip to England; we spent a few extra days on our own, and I insisted we go to see Diana's wedding dress, which was on display in one of the palaces in London. As the years went on, though, I picked up hobbies other than royal watching to fill the few hours each day I wasn't focusing on my career. By the time Diana died, I was so out of touch that I didn't hear about the accident until late the day after it happened. 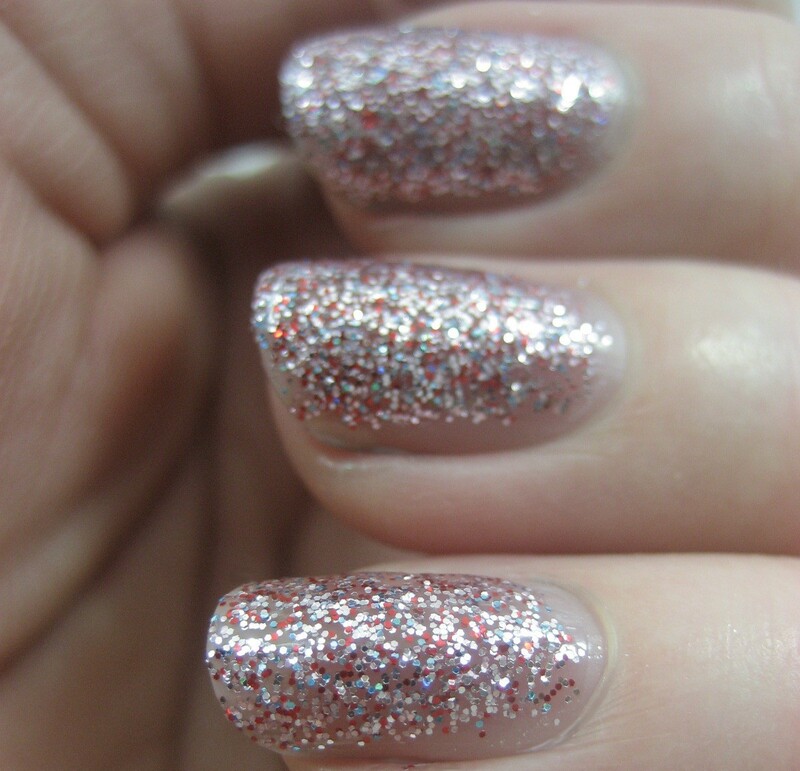 The point of this long preamble is to explain that I had no idea that today's royal bride was nicknamed "Waity Katie", so when Butter London came out with a polish called "No More Waity, Katie", I didn't get the joke. I did get that the polish had purple glitter in a greige base, three of my favorite things, so I made sure to track it down. It did not disappoint. The base is sheer enough to let the glitter show through, but opaque enough that it builds to decent coverage in three coats. I didn't use a top coat for these swatches; you can see it's not super shiny on its own, but I'm rather liking how it looks bare. Because it's sheer, I had to try layering it. The first combination I experimented with was one coat of No More Waity over Sally Hansen Xtreme Wear Celeb City, a silver foil. 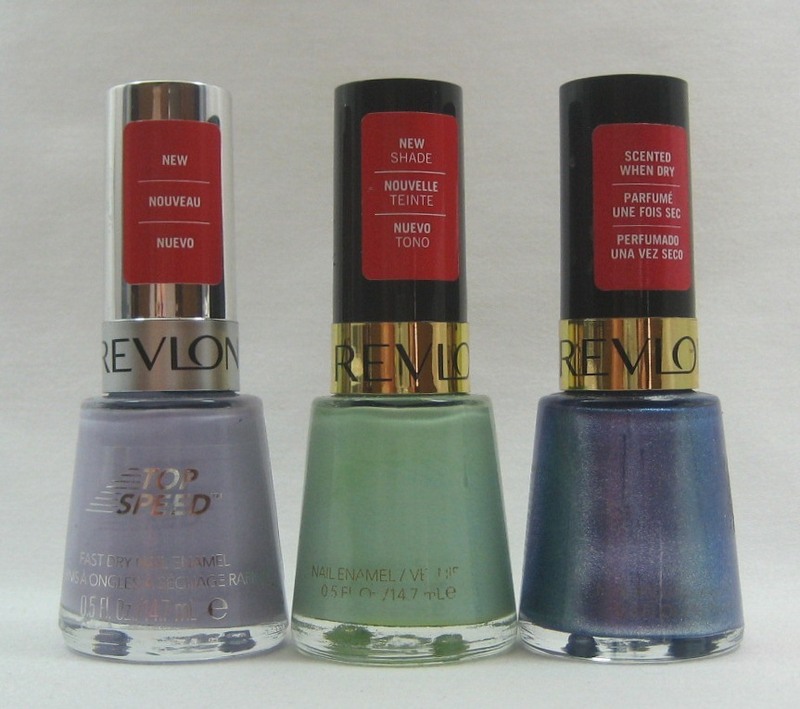 I was not entranced with the results, mostly because the unevenness of a single coat of the smoky base of No More Waity stood out against the light base. To try and disguise that, I added a coat of OPI The Color to Watch, which helped some, but I still don't think I'll use this combo for a full mani. 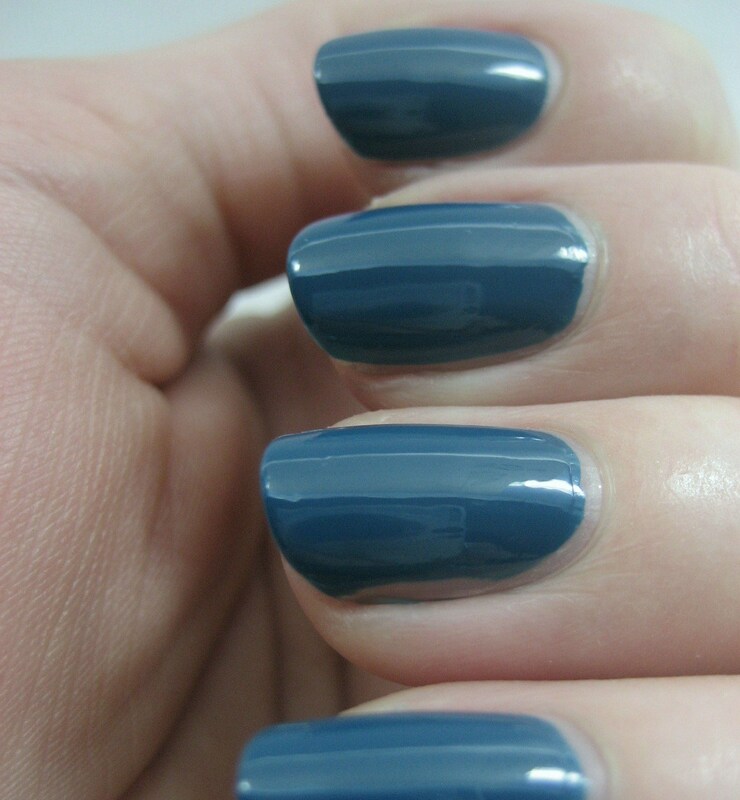 Next I tried a darker base color, Nina Ultra Pro Never Glum Plum, with one coat of No More Waity on top. Yes, much better. This I'd wear. Since I had The Color to Watch out anyway, I put a coat of that on top; I'd wear this combination, too. The veil of shimmer over the glitter adds more depth. I've no idea what this color has to do with the new princess, but like I said, I'm out of touch with royal stuff these days. 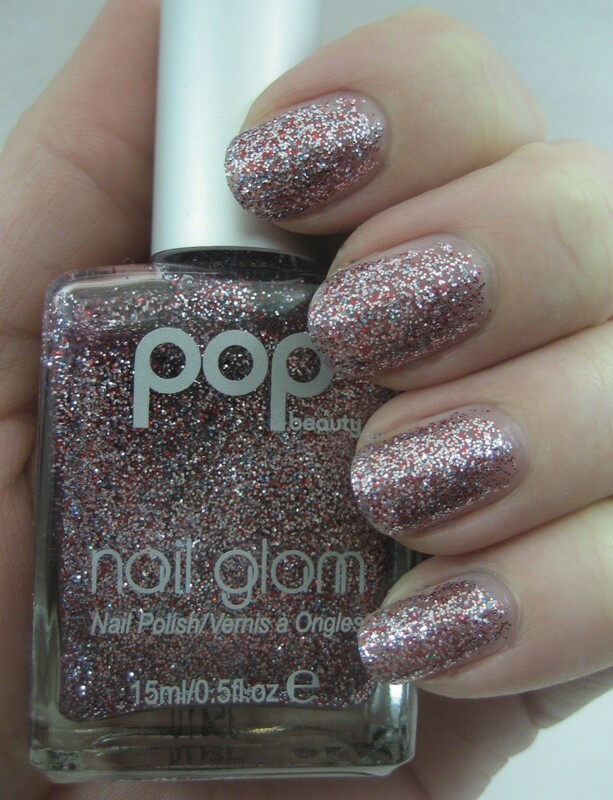 Based on the pictures of Kate I've seen (mostly on this LOLKate Tumblr, Kate Middleton for the Win), I wouldn't have come up with a purple glitter polish for her, but no matter, I like purple glitter and I like this polish. Maybe I'll put it back on to watch the wedding coverage that will be waiting for me on the DVR when I get home (I didn't consider even for one minute getting up early enough to watch live). Reminder: enter my 1st Blogiversary Giveaway if you haven't already. Based on a suggestion from cookiexcrumbs, I've added a link in the sidebar if you'd like to sign up to receive e-mail updates when I post a new entry. Or you can just click here and enter your e-mail address. SkinCareRx is having a Beautiful Mom contest in which they're giving away a $250 gift card. I recently added them (and the related sites Apothica and skinbotanica) as a sponsor; I'll have more to say about that after I get my first order from them and can report fully on the experience. But since the deadline for their Beautiful Mom contest is May 5th, I didn't want to wait to mention it. 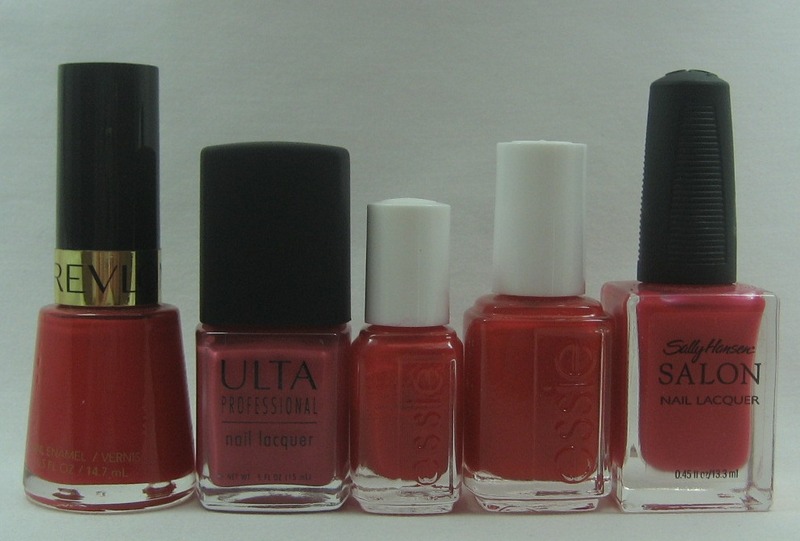 I recently got my first Sonia Kashuk polishes. I've wanted to buy some to try for a while now, but every time I went to Target the slots in the display were empty. 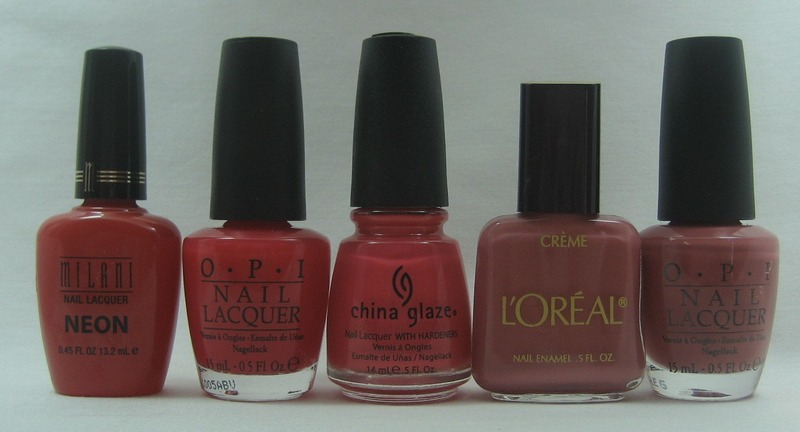 However, I got lucky a couple weeks back and picked up three colors (I passed on a bright pink and a coral that were also on the shelf). Left to right: Violetta, Tauped, Fatigued. 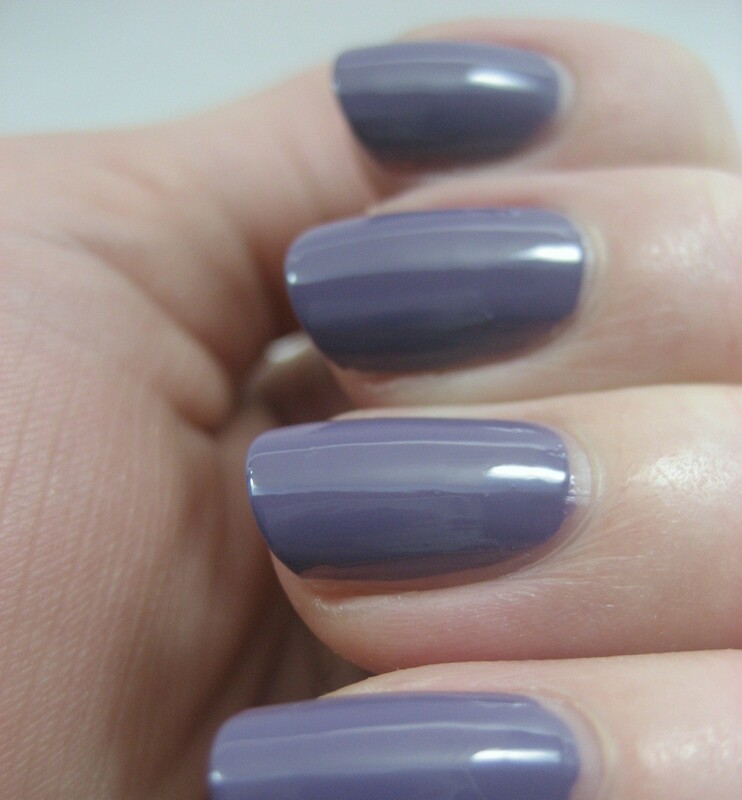 Violetta is a medium purple creme with a touch of dustiness to it. Tauped is, not surprisingly, taupe; it's also a creme. Fatigued surprised me. 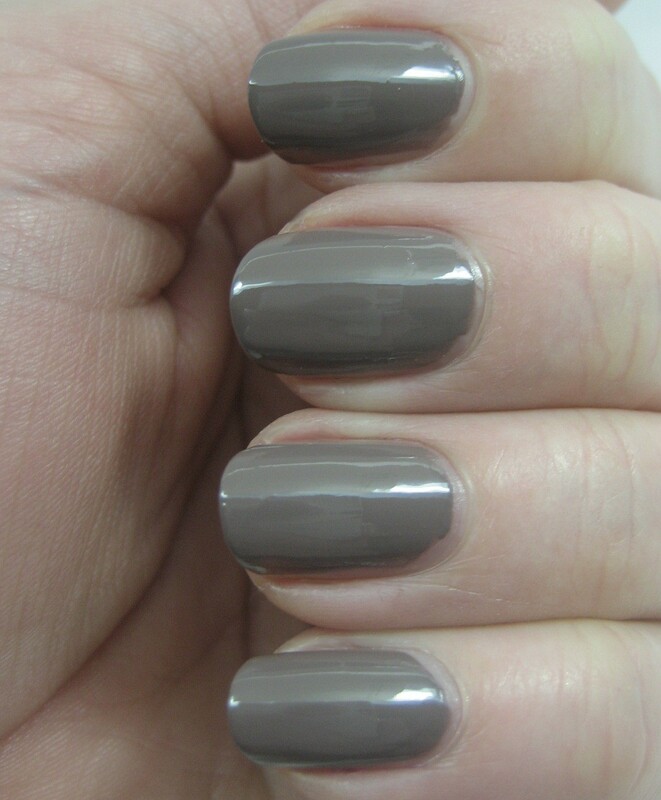 In the bottle, it looks like a warm dusty olive green, but on the nail it's much cooler-toned. This one has a slight shimmer to it. All of these were two coats. They sell for $4.99 per .5 fl. oz. (14 ml). I didn't do a wear test, so not sure how they'll hold up in a regular mani, but I had no issues with application. 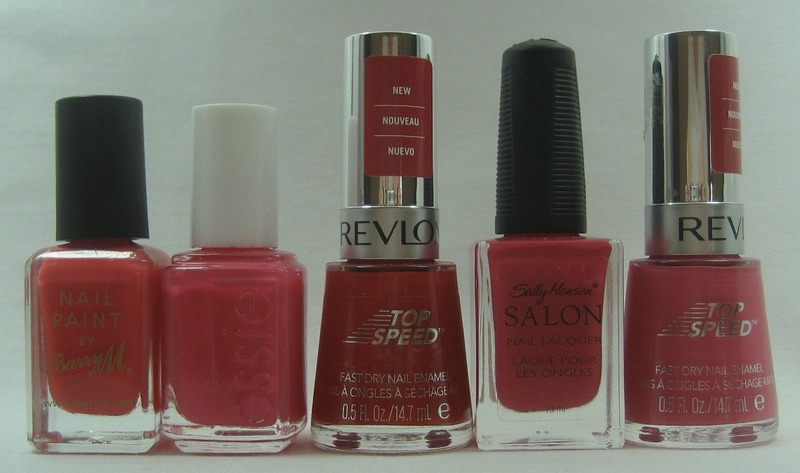 I want to do some comparisons with these soon. Do you have any requests? 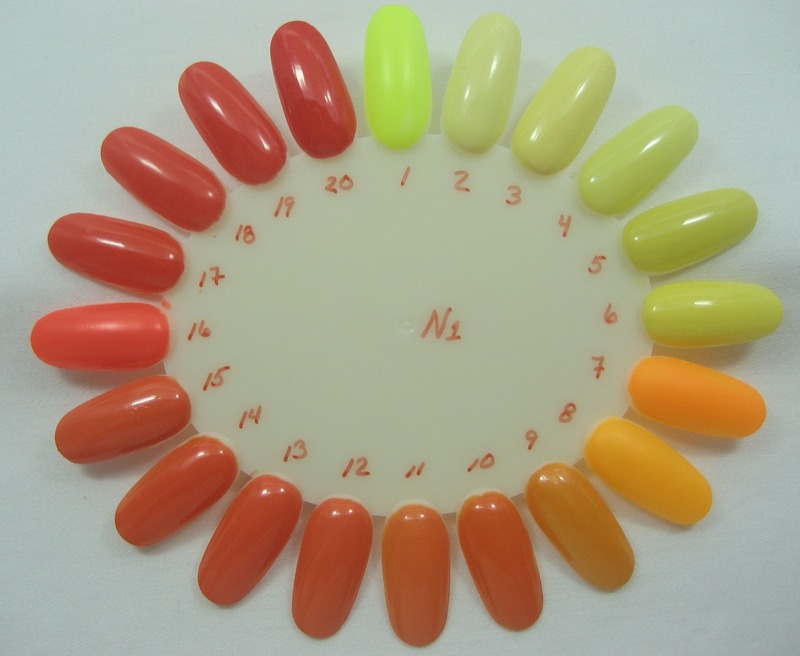 It's grey and rainy today in my corner of the world; looking at these bright yellows and oranges on Nail Wheel Wednesday is helping brighten things up a little bit. This next wheels has some colors that would be at home on a coral wheel, or even a warm pinks one, but they were in the orange drawer, so onto an orange wheel they went. One year ago today, I posted an announcement that I'd decided to turn this dormant space into a nail blog. At the time, I had no idea how much fun it would be or that I'd still be posting regularly a year later, long after the initial "yay, new project!" enthusiasm had worn off. Thanks to everyone who has supported me in this past year by reading, commenting, linking, e-mailing, following, swapping, or some combination of the above. To celebrate this milestone, I'm having a giveaway with 12 prizes, one for each month I've been blogging here. 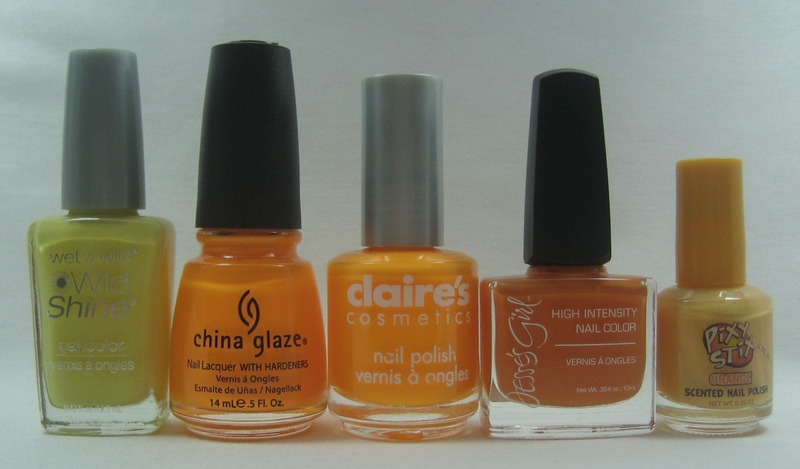 All of the polishes are new from the store. Because I'm in the mood for spring, I chose mostly pastels and bright colors to match the flowers I hope to see more and more of as the weather gets warmer around here. As seen in the lap of Easter sock monkey. Finger Paints Carnation Creation, Studio M On the Hunt, Wet 'n' Wild Collecting Pollen, Finger Paints Chrysante-mum's the Word. Neo Whimsical, Chinchilly, Borrowed & Blue. Complete set of six: 3D, Hi-Tech, Digital, Hi-Res, Cyberspace, HD. Lily, Minted, Not So Blueberry (scented). 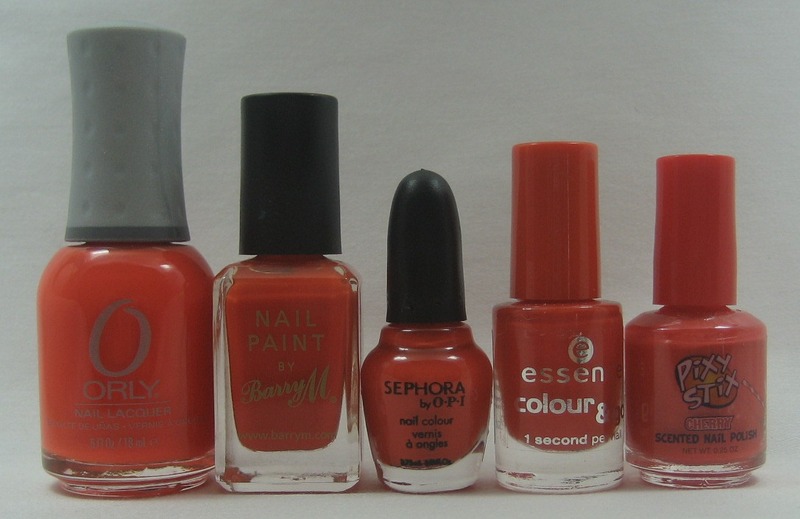 Complete set of six: Once Upon a Time, Welcome to Wonderland, Tinka's Dress, Fairy Berry, Pixie Dust, Humpty Dumpty. 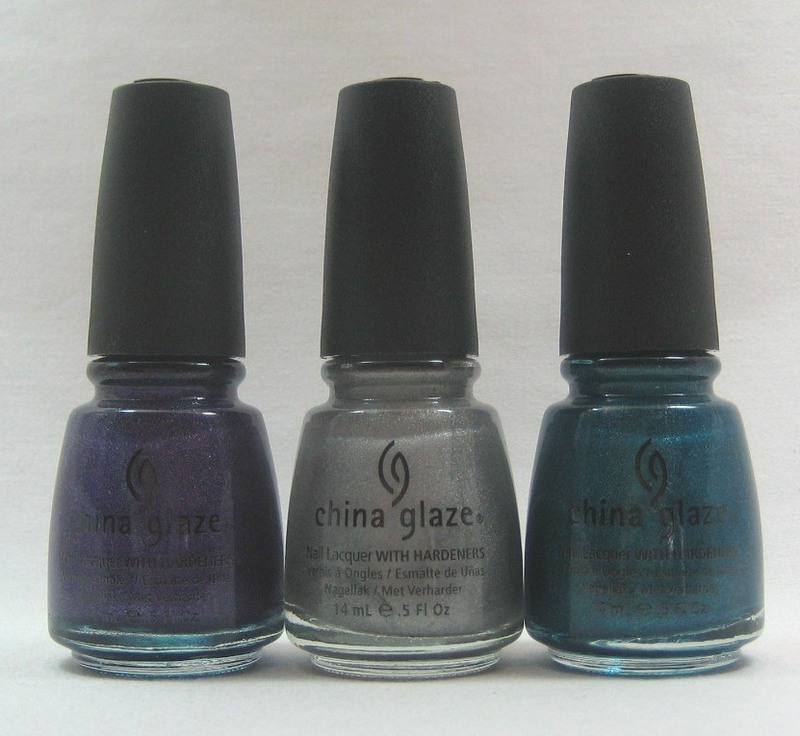 Virtual Violet, Hologram, Techno Teal. Complete set of first release: Fabulous/Funky, Daring/Innocent, Calm/Wild, Peaceful/Confident, Happy/Earthy. Golden Seahorse, Pretty Jellyfish, Sweet Violet (as seen on Wheel L1. Broken Hearted, Lightening Bolt, Crushed Candy. Cult Nails My Kind of Cool Aid and Butter London No More Waity, Katie (which I'll be sharing on Friday). Same as my last big contest, this will work like a raffle. Everyone who enters gets 10 "tickets" or chances. You can put all your tickets in for one prize, put one ticket in for each of your 10 favorite prizes, or anywhere in between. Depending on the luck of the draw at random.org, a single person could win more than one prize. If you're a public follower with Google Friend Connect, you'll get five additional tickets to put in for prizes. If you link to this entry from Twitter or your blog, you'll get five additional tickets as well. So, if you follow OR tweet/blog, you get 15 chances total; if you follow AND tweet/blog, you get 20. I'll be closing the contest at midnight in the Eastern U.S. time zone on May 17, 2011. To enter, just fill out the form. Don't worry overmuch about the math as far as the number of chances goes; I'm a trained accountant and computer programmer, so I'll get the data aligned before I do the drawing. International entries are welcome. Good luck, and thanks for reading! Edited to add an image with all the prizes together in case any of you would like to use it on your own blogs when you link. It was like someone deliberately chose colors to stock that they knew I'd like. Over the course of my next three or four visits, I got all of them but the pink (Pinkest) and bright purple (Violetta). 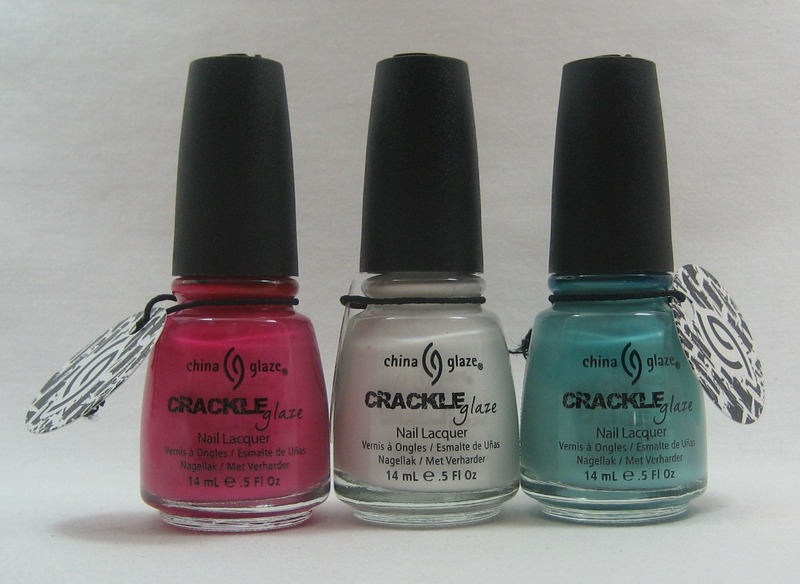 Left to right: Pink Glitz, Ultraviolet, Turquoise, Foggy, Punk'd, Gold Glitz. 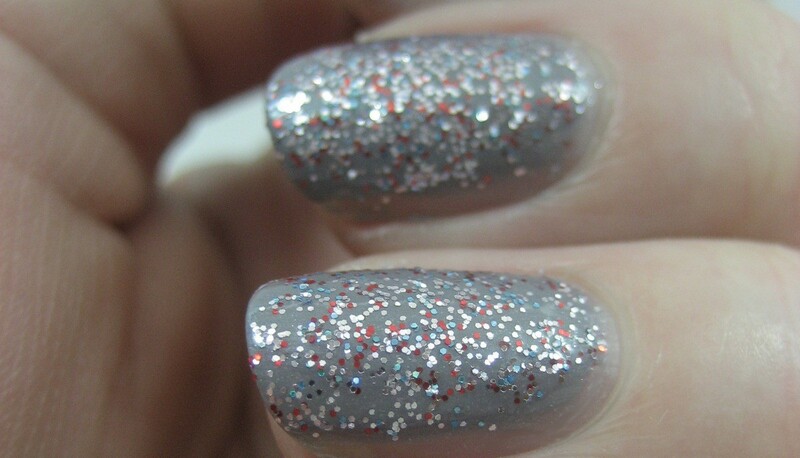 Punk'd was the first one I bought, so it was the first one I swatched. 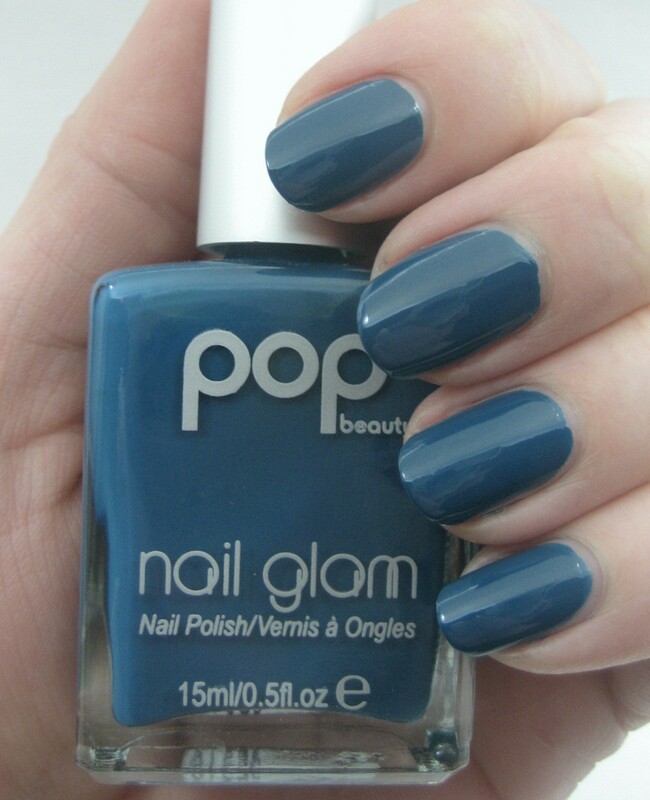 It's a slightly teal-leaning medium dark blue creme. It applied very nicely, covering in two coats and looking pretty shiny all on its own. Before I took Punk'd off, I experimented with using Gold Glitz on the tips. I liked the look but if I do this for a full mani I'll need to pay more attention to getting the glitter gradation consistent from nail to nail. 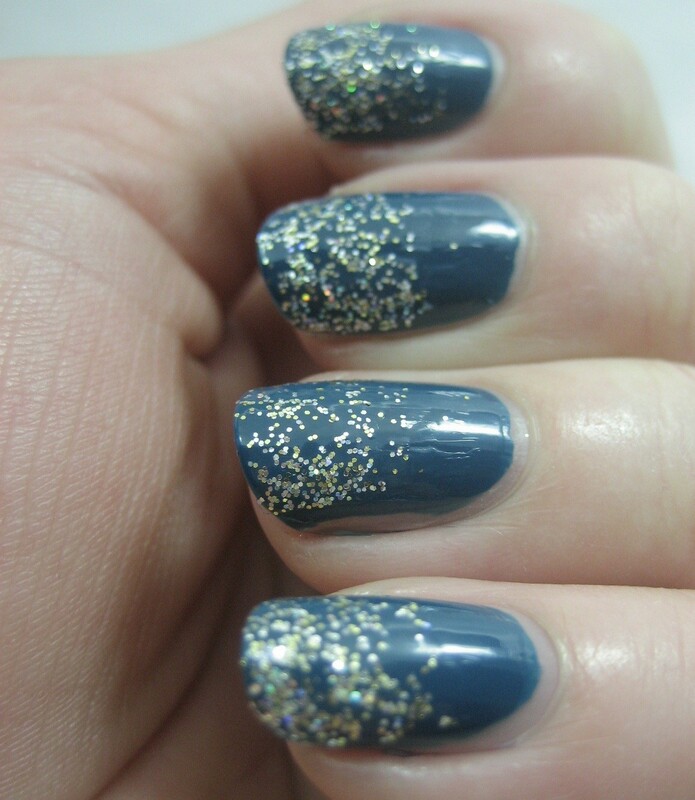 I then tried Gold Glitz on its own. 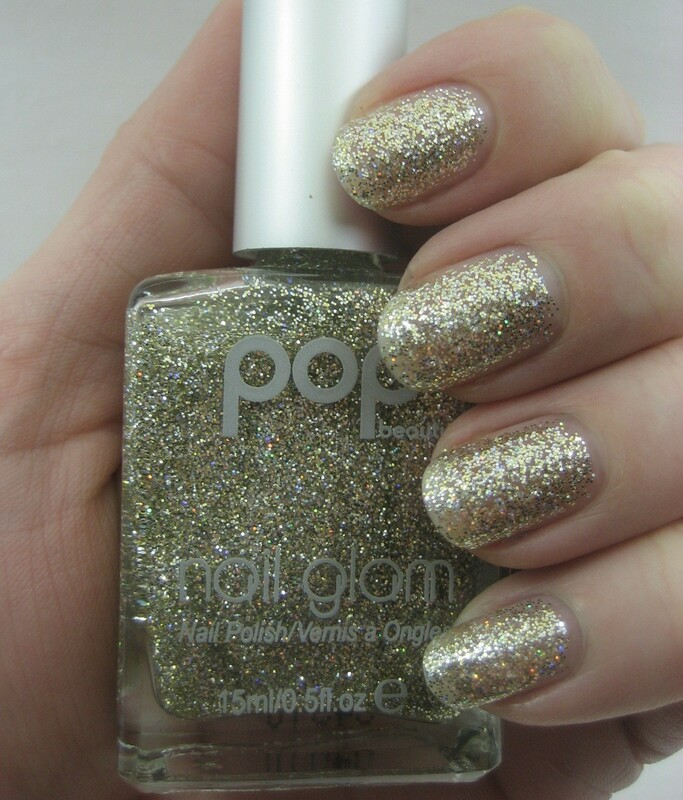 I almost passed on this one since gold is not my favorite metallic, but this polish has a lot of silver glitter mixed in with the gold plus a pinch of holo so when the light hits it, scattered pops of blue and red and green show up, too. It's pretty, though I think it really needs underwear. At three coats, my nail tips are still quite visible, and I don't like that look with glitter, especially yellow-toned ones like this. Pink Glitz is the other glitter in the line-up. 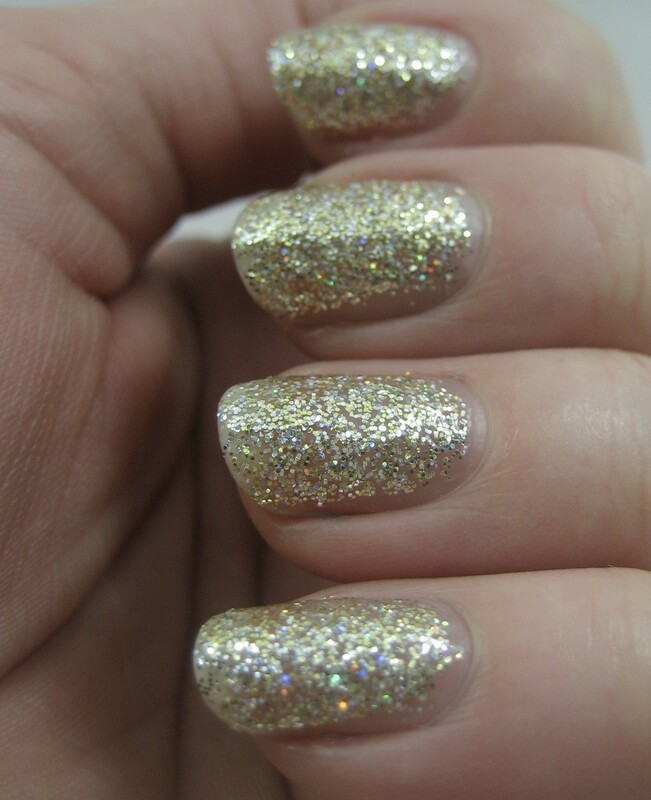 I used three coats of this one, too; it seemed to cover somewhat better than Gold Glitz. This is mostly silver and red glitter with a fair bit of blue added for an accent (pops of green show in some lights, too). The next two colors gave my camera fits, and I didn't have much luck correcting the color with my rudimentary image processing software either (though I did do a great job turning my skin different colors). Turquoise is a medium blue green creme, more green than what I think of as "turquoise". Ultraviolet is a vibrant blue-leaning purple creme. Two coats of these were plenty. 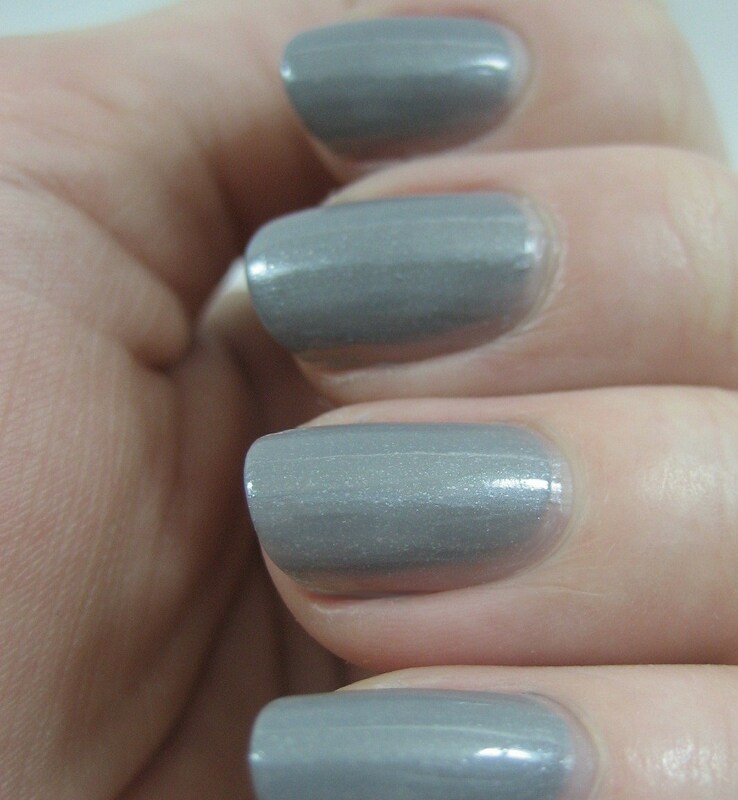 Foggy, the last of the bunch, is a cool-toned medium grey shimmer, also a two-coater. In bright light, I fancied I could see blue glints in the shimmer. Before I moved on from these, I couldn't resist combining my two favorites, Foggy and Pink Glitz. These are 15ml/.5 fl. oz. 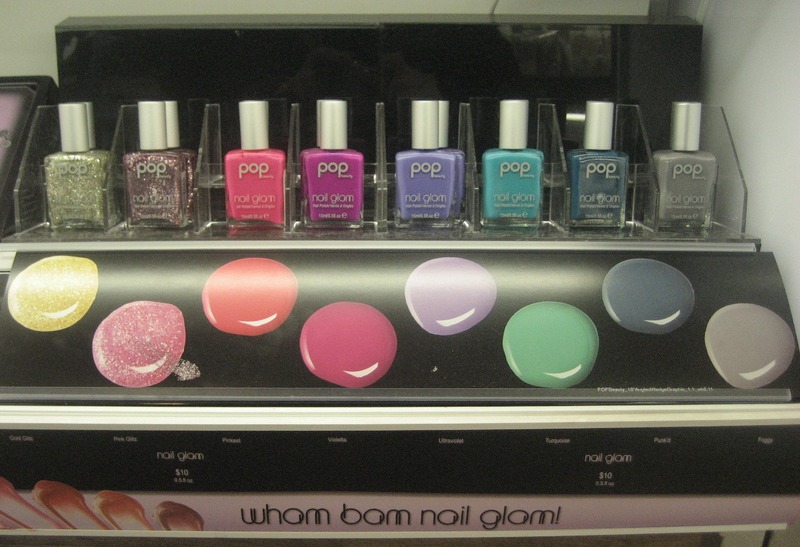 bottles and sell for $10 at Ulta. According to the Ulta website they're not eligible for coupon discounts (being on the prestige side of the store, I suppose) but I did use coupons on them, so evidently that restriction isn't being enforced consistently. When poking around on the web this morning, I saw that Beauty.com carries this brand as well, in more than the eight colors stocked at Ulta (though they don't have all of the colors that Ulta did). Most surprising to me, I also found it on CVS.com, and I know I've never seen this brand in a CVS store. There was at least one color on the CVS site that wasn't at Beauty.com or Ulta, too.